It was an especially stressful time at work. We had an ornery but very important client for whom we just couldn’t seem to do enough. Everyone at the agency had been putting in extra-long hours for more than a month to try and make him happy and retain the account, and I had reached a low point. I remember the day well. I grabbed a pair of scissors from my desk drawer and quickly made my way down the hall toward the ladies’ room. Our office “momager” – every advertising agency has one: a combination of mom and office manager – saw me breeze by with scissors in hand and got up out of her chair to follow me. She knew me well, and she knew what I was up to. “Don’t do it,” she said when she caught up with me as I swung open the ladies’ room door. “Please. Don’t. Do. It.” She was beginning to beg. But it was too late. 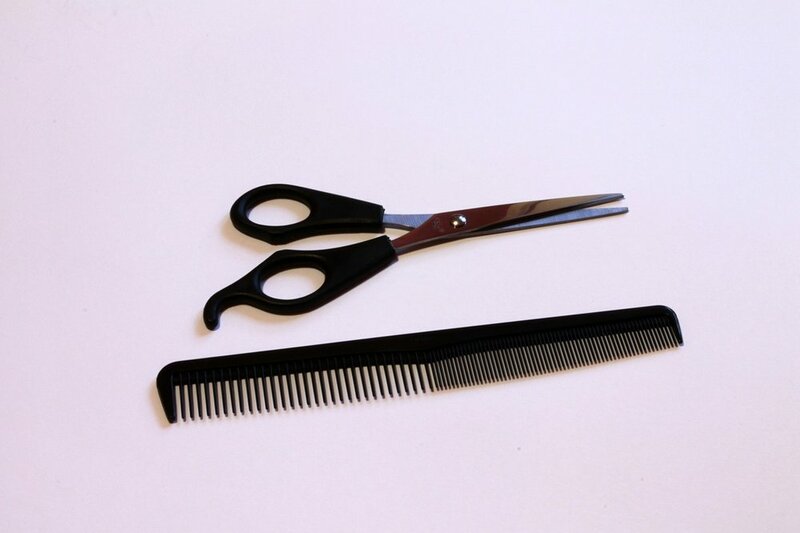 Scissors poised, I stared in the mirror, took a deep breath – and started cutting my bangs. After a few snips, I had worked up enough courage to move on to other areas of my head. Laundry was piling up at home, I had a stack of bills sitting on my kitchen counter that I hadn’t had time to open, the inside of my car looked like I was living out of it – and I’d had to cancel my hair appointment three times in as many weeks. My hair was becoming so bushy it was starting to look like it belonged on a porcupine. I finally had to take matters into my own hands since hair salons aren’t open at midnight. Well, I did do it again. This evening, in fact. While I don’t want to bemoan the fact that I’m battling Lyme Disease (nobody wants to hear about it ad infinitum, I know), it is true that there are days when you are sick and dragging. Today was one of those days. So there was simply no way I was spending two-and-a-half hours of time in “the chair” this evening getting coiffed and buffed. I cancelled my hair appointment. But my hair still needed help. It was starting to get that wild animal look again, and I decided to tame it. Myself. I have not sworn off the hair salon. Far from it. I’ll reschedule my appointment in a couple of weeks, but it’s good to know that I can handle a pair of scissors with some acumen if I must. If you ever find yourself stranded on a desert island with no salon in sight, or if you’re feeling desperate and looking for a way to git ‘er done and out of your face like I was tonight, I'll share a few tips my hair stylist gave me the last time I cut my hair myself. If you feel the need to do some DIY surgery, don’t cut your bangs straight across. Cut them upward in order to avoid the bowl effect. Cut your hair when it’s dry. Otherwise, you won’t be able to see how it moves. Cut only hair that you can see! Don’t try to do the back of your head. Don’t attempt to give yourself a whole new style. If you cut your hair yourself, don't expect it to look all nice and perfect (really, this should go without saying). In addition to evening up the ends and shortening my bangs, I also took out bulk. The comb/razor (at right) is a fabulous little find for under $6.00. I discovered it last year at Sally Beauty, thinking it might come in handy. I used it tonight and fell in love with it. You can see from the photo that it did its job well! Finally, I’m not suggesting that women should start cutting their own hair. I love my stylist and she does a great job. But for those times when you have to literally take matters into your own hands, it’s good to have a few tips.